Optimize and control your formulation with the Crystalline, the ultimate tool for delivering your best formulation in a tight timescale, at lowest possible costs and with a low risk of failure on the field. Designed by experts in formulation development, the Crystalline provides real time answers to all your questions related to process/manufacturing aspects, physicochemical properties, impurity profiling, particle size distribution and stability. Have you ever wondered what is happening during formulation development? Stop guessing: now you can see what is happening. You can easily correlate turbidity signals with visual information – finally getting the complete picture of the formulation process. Check the stability of your plant protection product by testing the effect of low and high temperatures on your formulation. With the 8 independently controlled reactors and integrated cameras, it is possible to study the effect of temperature and different formulators in a simple and easy fashion. 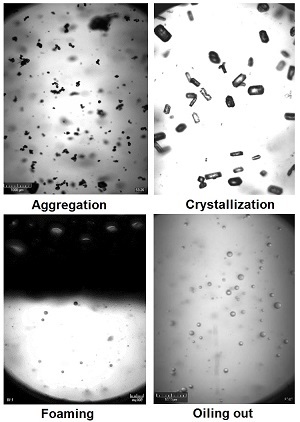 Crystalline enables you to efficiently determine solubility curves of your active ingredient and formulants. When appropriate, data related to relevant impurities can be also derived. The degree of dissolution and the dilution stability may be indirectly determined from the solubility curves. The real time turbidity measurements are carried out without any physical contact between sample and the probe – making this an extremely easy system to use. Just insert your sample into the reactor.